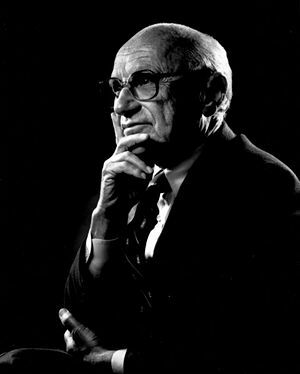 Milton Friedman (July 31, 1912 – November 16, 2006) was a Nobel Prize winning libertarian economist who emphasized freedom. He was a leader of the Chicago School of Economics and made the University of Chicago the leading center for conservative economics. He was the favorite economist of many conservatives (including Ronald Reagan), in part because nearly all other economists have been liberal. Friedman was an early advocate of free choice in education, such that parents could spend their school tax dollars on the school of their choice. Friedman received the 1976 Nobel Prize for economics. Friedman was born on July 31, 1912, to Sarah Ethel (Landau) and Jeno Saul Friedman. Milton Friedman said, "Roosevelt's policies were very destructive. Roosevelt's policies made the depression longer and worse than it otherwise would have been. What pulled us out of the depression was the natural resilience of the economy plus WW2." In one celebrated case, Milton Friedman called a special meeting at the University of Chicago, where he taught, to prove that the Coase theorem was false. But within two hours of discussion, Friedman had the intellectual courage and objectivity to reverse himself and admit that he was wrong and Ronald Coase was right. Many lesser intellectuals can spend their entire lives refusing to admit that they were wrong about something. Although the terms did not exist at the time, this meeting, and its results, demonstrate Milton Friedman's challenge of the hearsay society. Further still, Friedman's willingness to admit his error casts him as less of an expert and more as a member of the best of the public. I am in favor of cutting taxes under any circumstances and for any excuse, for any reason, whenever it's possible. Maybe I did well and maybe I led the battle but nobody ever said we were going to win this thing at any point in time. Eternal vigilance is required and there have to be people who step up to the plate, who believe in liberty, and who are willing to fight for it. The problem of social organization is how to set up an arrangement under which greed will do the least harm; capitalism is that kind of a system. Freedom in economic arrangements is itself a component of freedom broadly understood, so economic freedom is an end in itself ... Economic freedom is also an indispensable means toward the achievement of political freedom. The heart of the [classic] liberal philosophy is a belief in the dignity of the individual, in his freedom to make the most of his capacities and opportunities according to his own lights…This implies a belief in the equality of man in one sense; in their inequality in another. The most unresolved problem of the day is precisely the problem that concerned the founders of this nation: how to limit the scope and power of government. Tyranny, restrictions on human freedom, come primarily from governmental restrictions that we ourselves have set up. Inflation is the one form of taxation that can be imposed without legislation. Many people want the government to protect the consumer. A much more urgent problem is to protect the consumer from the government. Nobody spends somebody else's money as carefully as he spends his own. Nobody uses somebody else's resources as carefully as he uses his own. So if you want efficiency and effectiveness, if you want knowledge to be properly utilized, you have to do it through the means of private property. The most important ways in which I think the Internet will affect the big issue is that it will make it more difficult for government to collect taxes. The power to do good is also the power to do harm. If, for example, existing government intervention is minor, we shall attach a smaller weight to the negative effect of additional government intervention. This is an important reason why many earlier liberals, like Henry Simons, writing at a time when government was small by today’s standards, were willing to have government undertake activities that today’s liberals would not accept now that government has become so overgrown. Most economic fallacies derive - from the tendency to assume that there is a fixed pie, that one party can gain only at the expense of another. There used to be a saying: "Three generations from shirt sleeves to shirt sleeves". He attempted to explain economics to the general public, as in this appearance on the Phil Donahue show. This page was last modified on 26 September 2018, at 13:32. This page has been accessed 45,726 times.